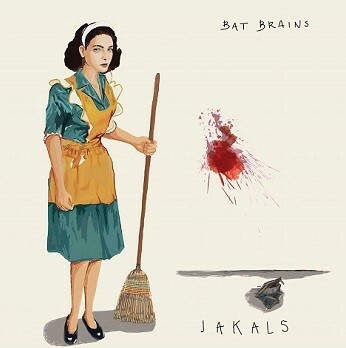 Jakals recently recorded a 6 song EP called Bat Brains at Mad Oak Studios with Benny Grotto. The full EP was released on August 13 in anticipation of their tour beginning on August 17. Bat Brains is a compilation of songs about anxiety, self-loathing, and addiction. The new EP contains powerful, driving, moving and mesmerizing songs such as “Porcelain,” where you will first fall in love with Katie’s vocal prowess, as this song shows her flexibility, and warmth and strength of her voice, while “pretty” at the same time. This particular track is one that you could totally picture hearing on the radio. Also of note, the drums are impressive and powerful in the track. The very relatable “Trauma Hoarding, which also includes vocals by Bredon Jones, “The Sound of Something Else” with its intense and soul squeezing vocals, and “Maybe this Time We’ll All Be Dead” are more “rockish” than previous releases, and a sound that suits them well. The song “Speeding” is Intense, deep, pretty, and melancholy with powerful vocals and lyrics. “When I was young I saw that I wasn’t enough. I grew envious of everyone.” I learned that I was flawed and I swallowed all of the lies…” “I used to laugh harder than anyone… I didn’t realize that was my dissent against a world that made me feel like I was worthless” This track is tied for favorite song on the new EP. I strongly recommend checking this song out. It’s all the Same – There is a video for this one – This was my first impression of the band. I strongly suggest you watch when you have 6 free minutes. Wow. Immediately the song came on really strong and I was like, “wow, no one is doing this. People need to know about this band.” The music is melodic and deep, the lyrics are haunting, eerie and powerful. Katie’s voice enhances and brings out the beauty of the dirtiness of rock and roll music. Emotional. Deep; substance and feeling. Katie’s voice definitely takes center stage, although the guitars and the music she is accompanied by fit perfectly, and the relationship certainly seems symbiotic. The new EP is a nice mix of solid, strong rock songs with compelling lyrics and piercing vocals, and deep, emotional and passionate lyrics, and melodic guitar parts and driving drums that melt perfectly together to form a beautiful combination of alt-indie-progressive rock that makes you both think and feel. This music isn’t something you put on as background music while you are doing your taxes or doing anything at all that requires attention and focus, as this music will BE the focus; folding the laundry will have to wait. This music is an experience. The tracks “Speeding,” and “It’s All the Same (especially),” you need to actually just lie down and experience those songs as a whole while not thinking about, concentrating on, or focusing on anything else whatsoever, and just really experience these songs and let them impact you. This music is more cerebral, yet at the same time emotional. It’s soothing, yet frenzy-inciting. Indy In-Tune was privileged enough to ask Katie from Jakals some questions in advance of the August 26th show at The Melody Inn. Indy In-Tune: How long have you been playing together and when/how did you meet? 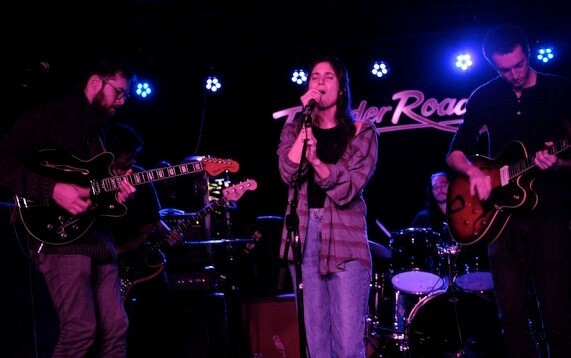 Katie: Jack Lewis and I started writing and playing together 4 years ago during college, but it wasn't until January 2017 that the whole band came together. Jack, Zach, Teryn, and I all knew each other from college, and Jack and I met Bredon in the Boston music scene. We had our first show as a full band in May of 2017. Tell the story behind the first release, “Keep Mother Sane” from 2017. How was the recording process, how long did it take you to write/record the album; what was the response like? "Keep Mother Sane" started as just me and Jack. We wrote all the songs when we were just a duo. The more we played those songs, the more we realized that we wanted a bigger sound for both the album and for our sound more generally, so we got the band together for the recording process. We worked with a friend from the Boston music scene, Nic Arouca, who has a mobile recording setup and we recorded most of the songs in my parents' basement. It ended up taking a couple of months because we weren't very prepared to play together as a band. We hadn't actually played any shows together at that point, and our first full band show ended up being our album release show. Jack, Teryn, Zach, and I were also in a pretty terrible house fire during the recording of "Keep Mother Sane", which definitely affected the process. How does the band approach the writing process? Does everyone write parts and bring them to the group; do you work together simultaneously, do you write lyrics after hearing the music, do you write lyrics first and then try to fit them with the music they write? Talk about that process and what works best for you all. The writing of each song is pretty different. Sometimes I come to Jack or Bredon with a song I've written on piano and we mess with it to make it work for the band. Sometimes Jack or Bredon will come to me with a guitar part and I'll come up with a melody and lyrics to that part. Usually I write the lyrics prior to the music. I write poems and lyrics all the time and generally will put something I've already written to music. Sometimes I'll read my lyrics to Jack and he'll come up with a guitar part that works with the emotions I'm expressing. We always work through the songs together as a full band after me, Jack, and Bredon put together the skeleton of the song. Who are some of your influences, both as a band, and you personally as a vocalist? As a band, we all have pretty diverse influences which can make the writing process pretty interesting. Each person has a pretty unique and varied taste, ranging from Bob Dylan to Death Grips, the Grateful Dead to West African music, Death Cab for Cutie to Talking Heads, and so on. I grew up listening to more traditional singer-songwriters like Sara Bareilles and Ingrid Michaelson. It wasn't until college that I realized how much music is out there and found music that resonated with me on a deeper level. Since then, I think some of my bigger influences have been people like Nick Cave, The National, PJ Harvey, Radiohead, and our fellow Bostonians Pile. You have some really powerhouse vocals, and a very unique and haunting sound to your voice at times. I was wondering where that comes from, where you learned such discipline and control. Have you had classical training? Were there vocalists that inspired you more than others as you were developing your own unique sound? Thanks!! I haven't had classical training. I took some singing lessons as a kid and a few lessons in college and after. I wanted to be able to sing in a way that was healthy so I wouldn't hurt my voice. When I was younger, I was definitely inspired by people like Amy Winehouse and Sara Bareilles, but as I've gotten older, my influences have come from a more rock-oriented place, especially from people like PJ Harvey and Angel Olsen. The new 6-song EP is truly fantastic. You were kind enough to allow me to listen to it prior to its August 13 release date and it really impressed me. Can you tell the backstory to this EP, any notable details about the writing/formation/recording of it, and how, if at all, you went about it differently with this EP than the first release. The recording of "Bat Brains" was a wildly different process than "Keep Mother Sane." For one, we had played tons of shows together as a full band for a year and spent a lot of time crafting these songs together, so there was much more of a collective excitement to record and share them. We had played all of the songs on the EP at least a few times live by the time we recorded them, so we knew them all in a much more intimate way than we had on the first record. We decided to record in a studio for this EP, so we were on more of a strict schedule which ended up being really good for us because it made us practice a ton and be very prepared when we went into the studio. We recorded at Mad Oak Studios in Boston with the amazing Benny Grotto. I have to say, all 6 songs are good, but personally, my 3 favorites are “Porcelain,” “Speeding,” and “It’s All The Same,” in no particular order (even though I think “It’s All The Same” is one of the best songs I’ve heard in a very long time). Do you have a favorite track on the album, or one that means more to you than the rest? I think everyone in the band has a different favorite, but my personal favorites are probably "Speeding" and "It's All The Same." They both are extremely personal and were the first times I've felt able to articulate some of my personal experience with addiction and the anxiety around that. "It's All The Same" was also the first song that was really a full band effort to write. Jack came with the basics but we worked on it a ton as a full band and everyone had input and it was the first time that had happened. That feels really special to all of us. The song “It’s All The Same” --- This was my first impression of the band. Wow. It came on really strong and I was like, “Wow, no one is doing this. People need to know about this band.” The music is melodic and deep, and the lyrics are haunting, eerie and powerful. It sounds like you’re dumping your entire soul out on this song. Your voice sounds so trained and controlled, yet still so powerful and vulnerable at the same time. There are intricacies; nothing at all sloppy about this whatsoever, but it doesn’t sound contrived or forced, despite the seemingly clean and neat structure of the music and vocals. At 3:30 into the song, my mind was blown. And by 3:50, my heart was in my throat. It was a feeling similar to what one would expect it would feel like to get a gasp of air after been trapped under water for 3 minutes. You cling to it, and it feels as though your life is saved. It is a truly powerful song that really grips through your skin, bones, tissue, organs, down to your soul. This song literally rips everything out of you emotionally; you come out like a baptism when it’s over. You feel cleansed of what was weighing you down, and reborn and naked and vulnerable. It’s truly powerful. I am wondering if you have any back story you wanted to share about this song. Wow, thank you so much! It means so much that it had that effect! "It's All the Same" deals with the feeling of losing yourself in the midst of an addiction. It's about feeling profoundly disconnected and isolated after returning to reality after being in a sort of fugue. We wanted to make a song that reflected the intensity of that feeling in a really visceral way. The song “Speeding” is intense, deep, pretty, melancholy, with powerful vocals and lyrics. For example, “When I was young I saw that I wasn’t enough. I grew envious of everyone.” I learned that I was flawed and I swallowed all of the lies…” I used to laugh harder than anyone… I didn’t realize that was my dissent against a world that made me feel like I was worthless.” Where did this come from? I can feel something behind this song. Can you elaborate on what this song means to you and where it comes from? This song came from a feeling of profound anger and sadness. When I wrote it, I was thinking a lot about when I was growing up, and trying to force my brain to conform in ways that it wasn't meant to. We live in a society that values certain forms of intelligence and behavior over others and pressures people to fit that mold. I forced myself to conform in a lot of ways that weren't natural to me in order to be the kind of person I thought I was supposed to be. I think that by changing myself to fit into those expectations, I lost other parts of myself that actually made me feel good. In this song, I'm expressing some of my confusion, discontent, and fears. How are your feelings about touring/playing live shows as opposed to studio recording? We had so much fun recording but we really love playing live. Honestly, they are just so different it's hard to compare. But there is a certain energy in live settings that can't really be replicated or explained. We're often still playing in rooms where people aren't listening very intently, and that can make it hard to get into the songs live, because it's difficult to share such intense personal feelings if the audience isn't very engaged. That said, when we do get to play in rooms where people are there for the music, it's such an incredibly cathartic feeling that can't be replicated in a studio. Are you guys really active in the local Boston music scene? What’s the music environment there for local artists? The Boston music scene has been pretty incredible. I keep saying I might want to leave Boston because I've just lived there for so long, but it's so hard to leave because the people in the music scene are some of the kindest and most supportive people we've ever met. Jack and I were terrified to start playing in public the year after we graduated from college and we ended up going to an open mic at The Lizard Lounge in Cambridge where we met so many people who encouraged us and made us feel welcome. Since then, the support has only gotten stronger. Everyone goes to each other's shows, shares each other's music, and encourages each other. Some cities have a more competitive environment for bands, but Boston is the complete opposite and that's really wonderful. We play a couple shows a month in and around Boston and try to go to as many of our friends' shows as we can. Is this your first time visiting Indianapolis? What can Indy fans expect from a Jakals live performance? This is our first time visiting Indianapolis as a band! We are really excited, it's absolutely one of the places we're most looking forwarded to playing. At this Jakals' live show you can expect Katie and Bredon's awkward stage banter, loud but also quiet music, at least 2 mentions of my dog Barney, and some great music from The Breakes and Pinky and the Basterds! Infinite thanks to Katie and all of the Jakals for granting us this interview and an intimate look into their process and their songs. I encourage EVERYONE to come out to the show; you will not be disappointed. Check out local openers The Breakes on ReverbNation. They have really groovy songs on there; different from one to the next, and something for all tastes. Great guitars, nice vocals; smooth, but not overly polished. Their Beatles cover of “Hey Bulldog” is legit, and I’m not typically a fan of people covering The Beatles, due to their sacredness to me, but this was a totally acceptable cover that I absolutely enjoyed hearing their spin on. 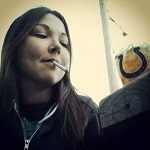 Founded by Adam Meyers, Joe Frazee, and Adam Vorndran in 2011, “The Breakes are an indie rock band from Brownsburg, IN. Through the combination of their shared and differing musical inspirations the band has a sound that varies from song to song, focusing on everything from heavy dance tunes to smooth summer jams. They have recently added longtime friend and new full-time drummer Chris Kelly to the lineup which has brought more depth and musical prowess to an outfit focused on both studio creativity and live performance perfection. Their 2014 debut record Free of Defects displays The Breakes songwriting full force with such tracks as surf rock song "Sing Them Loud" and psychedelic jam "Satisfaction Guaranteed." Local favorites Pinky & The Basterds are also providing support, and always guarantee a great show. Come out on to the Melody Inn on August 26th to see this great show with 3 awesome bands. Show some love and check out some fantastic music in our city.